PET (also named PETE) is a kind of polyester material for fiber, injection molded parts, as well as blow-molded bottles and jars. Special grades are offered with the required properties for the different applications. manufacturers in the form of small pellets, each about 0.05 gram. PET came into prominence in the 1950s as a textile material. Its strength, temperature tolerance and wear-resistance made it an ideal replacement for, or addition to natural fibers such as silk, cotton and wool. It has good antiosmosis, low water absorbability and good toughness. PET film's tensile strength is similar with aluminum film's, and is three times that of PC and PA film. PET film is transparent. It's tensile strength can reach 1/3~1/2 of steel's if dealed by oriented draw. It's the toughest thermoplastic film. It will be burnt with yellow flame and will burst when burning. And it will continue burning when away from fire. and heat tolerance.Since PEN canbe blended with PET a range of new 'alloys' is becoming available for special packaging applications. As PET (bottle grade) is a kind of transparent, wear-resisting and corrosion-resisting plastics with high strength and smooth finish, it is widely used for PET bottles of mineral water, juice, edible oil, pharmaceuticals, cosmetics, etc. PET products can be made crystallizable or non-crystallizable through controlling crystallization temperature and cooling speed. Usually it's crystallinity is 0~50%. The higher IV value, the slower crystallization speed. evel is high, hydrolysis will happen while molding and it's IV value will drop which means products' quality be affected. For CSD bottle, <=9ppm required; for mineral water, <=4ppm required. In the bottle industry, the length of the PET chains is usually described by the resin IV (Intrinsic Viscosity). Bottle grades have IV values of about 0.65 to 0.85 dL/g, or about 100-155 repeating units per chain. Most bottle grades of PET are copolymers, which means that a few percent of a modifier has been incorporated into the polymer chain. Copolymers are easier to injection mold because the crystallinity behavior is improved. Aremarkable transformation takes place when injection molded PET is stretched at the right temperatures and to the right extent. The long chains undergo strain-hardening and strain-induced crystallization, which gives the properly-made PET bottle exceptional clarity, resistance to internal pressure, uniform wall thickness, toughness, and a host of other features. To achieve these useful properties, however, care must be taken in choosing the right grade of resin, as well as the right preform and bottle designs, and good molding practices. Some grades of PET have other modifications to improve the bottle barrier properties, the reheat characteristics (for two-stage systems), or the generation of AA (acetaldehyde). Products look good, pure and healthy. Sparkling PET bottles attract attention. Brilliant glass-clear presentation of your products. Products taste good. PET complies with international food contact regulations. 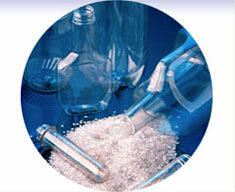 PET bottles are tough and virtually unbreakable during production, storage and transportation. If they do fail, they split, not shatter. Their high impact and tensile strength makes them ideal for carbonated products. The low permeability of PET to oxygen, carbon dioxide and water means that it protects and maintains the integrity of products giving a good shelf life. PET also has good chemical resistance. 10% weight of an equivalent glass pack, PET bottles reduce shipping costs by about 30%, and because the material in the wall is thinner, shelf utilization is improved by 25% on volume compared to glass. High strength, low weight PET bottles can be stacked as high as glass. Absolute closure integrity is possible because of the injection molded neck finish. The absence of a weld line in the base means that PET bottles don't leak. Suitable for containers of all shapes, sizes, neck finishes, designs and colors. Excellent environmental profile due to single material. Used PET bottles can be washed, granulated into flakes and reshaped as PET bottles or employed as material for strapping, carpeting, fiber filling, etc. Specially designed thick-wall bottles can be washed, refilled and reused. PET is made from the same three elements (carbon, oxygen, and hydrogen) as paper, and contains no toxic substances. When burned, it produces carbon dioxide gas and water, leaving no toxic residues. PET offers the best chemical resistance performance of any mainstream polymer used in packaging today. Very good shelf-life performance, especially with the new higher barrier formulations.